“Let yourself be open and life will be easier." Of course, Buddha didn’t say that to me directly. My friend Krystina Morgainne puts out a daily inspirational message and this was today’s wisdom. Interesting synchronicity. 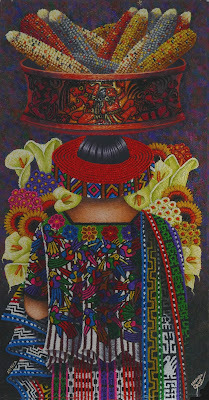 The painting shown is one I bought from Pedro Arnoldo Cruz Sunu, an artist who was here briefly in Ajijic. I didn’t get to meet him when he was here, but somehow we connected on Facebook and I fell in love with his art. Eventually, he posted a photo of one of his works that I couldn’t say “no” to and it arrived yesterday. I had hoped that I would like the painting as much in person as I had in the photo. Actually, it is far more stunning in real life as it has an almost sculptural effect. 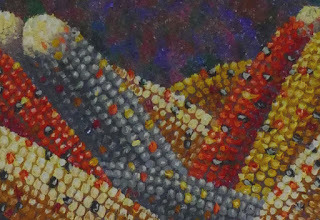 The paint is three dimensional, reflecting the textures of the subjects. The fabric looks woven or stitched, the corn kernels are rounded or shriveled where they have dried, the calla lilies are veined. I hope this detail gives a sense of the texture of the painting. I was curious about the pattern in the garment shown and was only slightly surprised when he said the design was Guatemalan. I thought it looked Guatemalan, but I assumed he was Mexican. In the course of our Facebook back and forth chat about shipping the painting and so on, I learned a bit more about his creative process and him. What Pedro told me and what the Buddha said just makes me smile and shake my head at the same time. 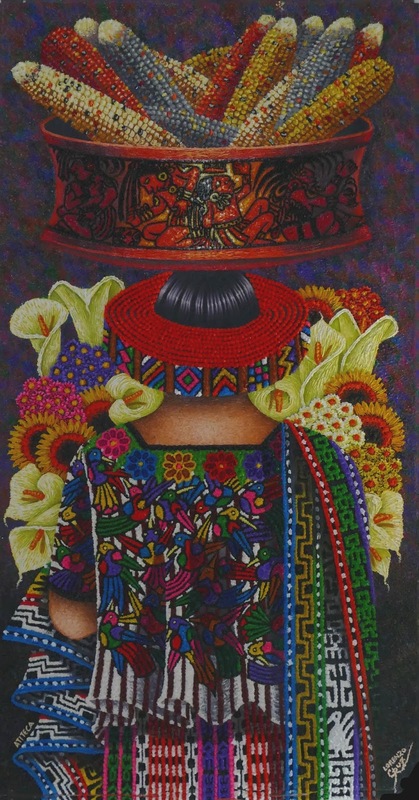 Not only is Pedro a painter, he is a painting collaborator with his brother, a collaboration they consider sacred which has gone on for 18 years. And, he actually lives in Guatemala. 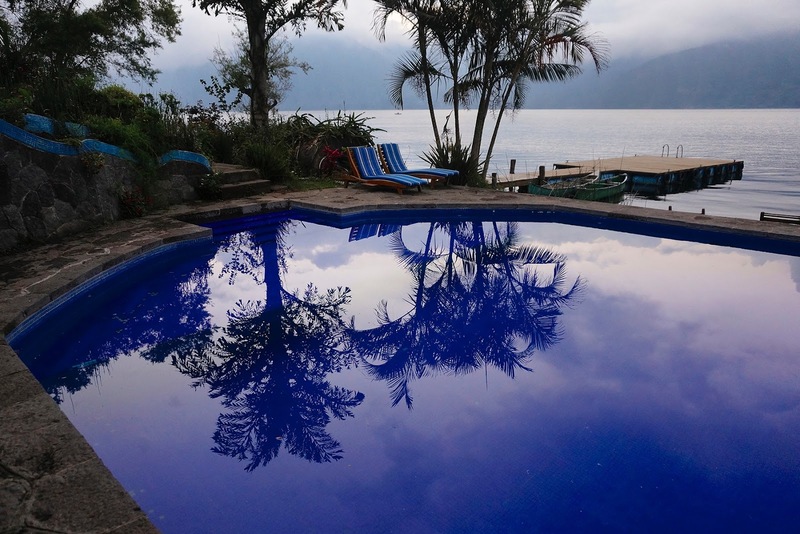 I only know one place in Guatemala, however, I fell in love with that one place … Lake Atitlán … and have always wanted to back. You probably know where this story is going. Yes, Pedro lives on Lake Atitlán, and yes he invited me to come down to visit … and stay in his gallery … and, yes I am going when I can figure out dates. What else could I do? The Buddha told me to let myself be open. For more about Pedro and his amazing art, see his Facebook page. What a fabulous connection. Some things are clearly meant to be. And the textures are exquisite, the textile-patterns beyond delicious! Life continues to delight. hugs. What makes a photo work? Don’t sneeze hate … it’s contagious.